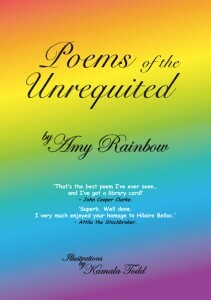 Poems of the Unrequited by Amy Rainbow. Beautifully Illustrated by Kamala Todd. Poems of the Unrequited is a superb collection of twenty one poems exploring life’s most magnificent themes. From foreign travel to The Women’s Institute, from straying partners to nits, this marvel of a book takes a wry look at the ordinary and makes it extraordinary. Stunningly humorous with an underlying wistfulness, these poems will lead you on an unforgettable journey which traverses the very landscape of unrequited life itself. It will make you laugh, it will make you cry, it will surpass every single expectation you have ever held. Ah, go on, buy one. You know it makes sense. All pictures © Kamala Todd. ‘Hilarious. Not at all Pam Ayres.’– Fergus McGonigal, Vogon poet and lawnmower expert. Poems of the Unrequited can also be bought from The Great Malvern Hotel, Graham Road, Malvern or Aspect Design in Newtown Road, Malvern.